The day-to-day work of the General Osteopathic Council (GOsC) is guided by our Corporate Strategy and Business Plan. 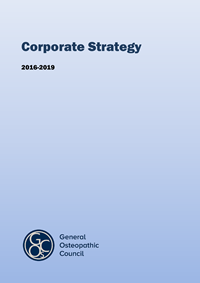 The Corporate Strategy sets out the priorities of the GOsC for the years 2016-2019 and has three main purposes. It describes what Council wishes the organisation to achieve. It provides a mandate for the organisation’s work programme, led by the Chief Executive and staff team. It provides a framework for the monitoring of the organisation’s performance by Council. The strategy describes our goals and key activities against three main objectives. It also explains how we will measure our performance, and how assurance is provided that the organisation is operating effectively. to use our resources efficiently and effectively, while adapting and responding to change in the external environment. Partnership is at the heart of delivering our objectives; a regulator is not synonymous with the profession it regulates and we believe strongly that, where appropriate, we should work with others to achieve them. Each year we publish a detailed Business Plan setting out the work we will do in order to meet our goals. Copies of this are available on request from the Head of Finance, email finance@osteopathy.org.uk. Council will receive at each meeting a report of progress against the annual Business Plan.